The story of the 2nd Missouri Artillery is very much atypical, when considered beside other artillery formations raised during the Civil War. Yet, that atypical unit history is somewhat a typical for Missouri regiments. I’ve discussed some aspects of the 2nd Missouri’s history in previous posts (see here, here, here, here, and here). But let’s go into a few more of those particulars, just so you see how “atypical” this unit was. 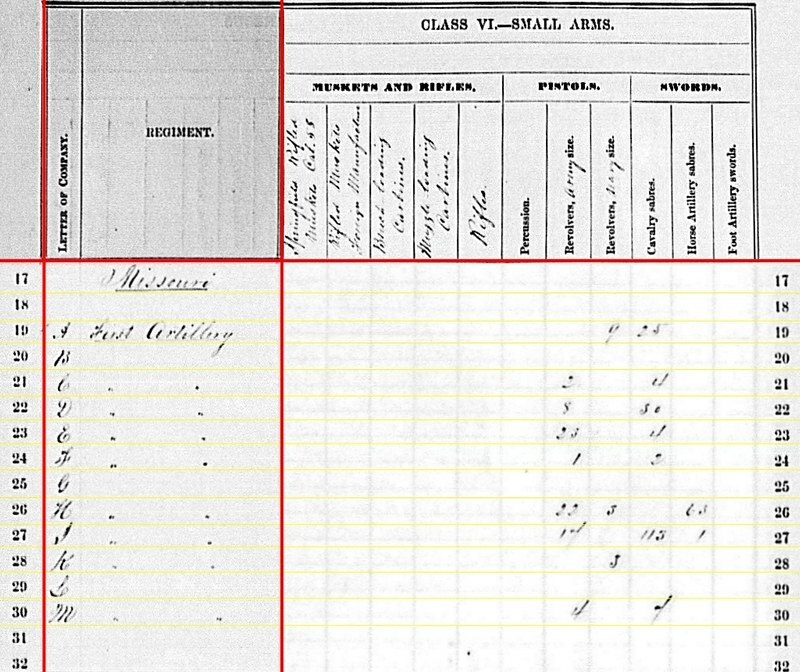 The 2nd Missouri Artillery’s origins lay in those confrontational days in May 1861. Missouri was teetering on the verge of secession and a young Army captain named Nathaniel Lyon moved to prevent such. In order to put a force on the streets of St. Louis, Lyon acted, not with direct authority at that moment in time, to muster a force of Missouri militia into Federal service for a period of three months. Lyon later received full backing, and a brigadier-general’s star, in these efforts. The militia mustered by Lyon were designated the “United States Reserve Corps” and, under terms of enlistment, were limited to duty in St. Louis… though later stretched a bit to include locations in eastern Missouri. This Reserve Corp consisted of five infantry regiments and one cavalry company. By late July, when these units were nearing muster out, Lyon’s adjutant, Major John M. Schofield, issued Special Orders No. 19, in which allowed the three month Reserve Corps to muster out, but be replaced by units raised with three-year enlistments. That is, provided no other “emergencies” arose that required those militia to remain in service. But before those orders could be applied, Lyon had met his end at Wilson’s Creek and there was just such an “emergency” to deal with. Lyon’s replacement, Major-General John C. Fremont, expanded the Reserve Corps, retaining the five regiments of infantry and adding two squadrons of cavalry and two batteries of light artillery, under orders issued on August 12, 1861. This expansion used the authorities granted under Special Orders No. 19 to enlist men for three years. 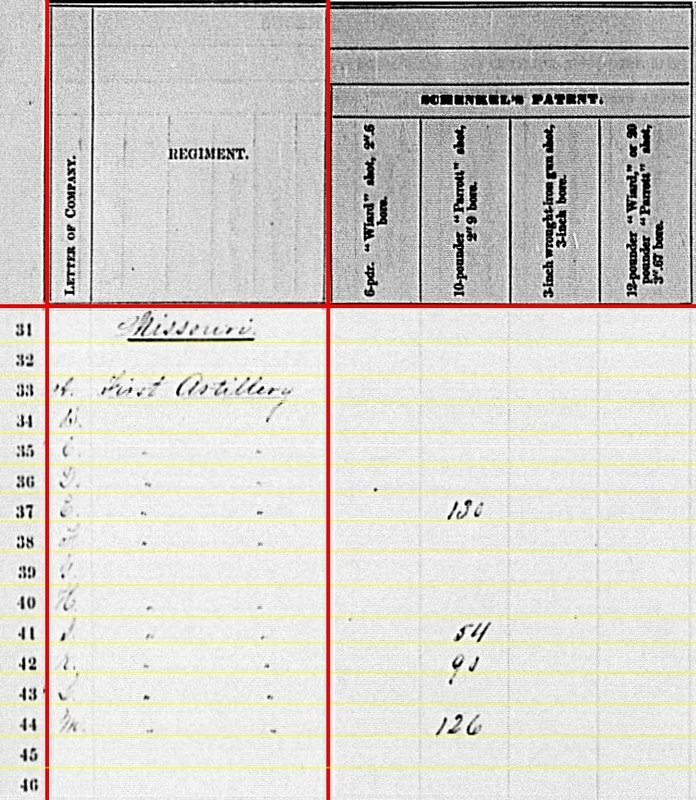 Under Fremont’s organization, or lack thereof, several formations were raised under designations of “Home Guards” or “Reserve Corps.” By late October, Fremont expanded these reserves again to include the First Reserve Corps Artillery – twelve companies of heavy artillery and three batteries of light artillery. And it is those fifteen “Reserve Corps” artillery companies/batteries which eventually became the 2nd Missouri Artillery. In assigning you to command the Department of the Missouri, it is probably unnecessary for me to state that I have intrusted to you a duty which requires the utmost tact and decision. You have not merely the ordinary duties of a military commander to perform, but the far more difficult task of reducing chaos to order. And who better to assign to that task than Halleck? McClellan went on to instruct Halleck to examine all unit musters to identify “any illegal, unusual, or improper organizations….” And in those cases, Halleck offered legal, three-year enlistments as a means of retaining the formations. Simple solution, right? But Halleck had a problem for which there was no simple solution. The men of this “Reserve Corps” and the Home Guards had enlisted with several stipulations and guarantees. One of which was service only in the state (or in some cases within St. Louis). Furthermore, the authority of the U.S. officers was somewhat limited over these state formations. By mid-December, Halleck decided the best way to resolve this was simply pay off the troops for the time in service, and go about recruiting new three-year regiments. However, hindering Halleck’s attempt to clear out this “chaos” was the paymaster’s refusal to pay troops who had not been properly mustered, and for whom rolls were incomplete. And at the same time, subordinate commanders were reluctant to simply release these able body men, as they might not reenlist. Concurrent with that order, the infantry regiments (which were actually designated by numbered “Reserve Corps” on the books) were consolidated into volunteer regiments. This led to mutinies and desertions throughout the first half of 1862. Commanders rated the units as “useless” for the duties required. The story of the infantry and cavalry “Reserve Corps” falls out of our scope here. So the short version is that on September 1, 1862, Schofield (now a Brigadier-General and in charge of the District of Missouri) issued Special Orders No. 98 directing the muster out of all Reserve Corps regiments. But the artillery of the Reserve Corps was a different story. Under Halleck’s early attempts to bring order, the Reserve Corps artillery was redesignated the 2nd Missouri Artillery Regiment (orders dated November 20, 1861). Colonel Henry Almstedt was appointed commander. Furthermore a mustering officer had processed the artillery troops into formal, legal, three-year terms. Indeed, around that time some 320 men who didn’t wish to remain as three-year volunteers opted to muster out. 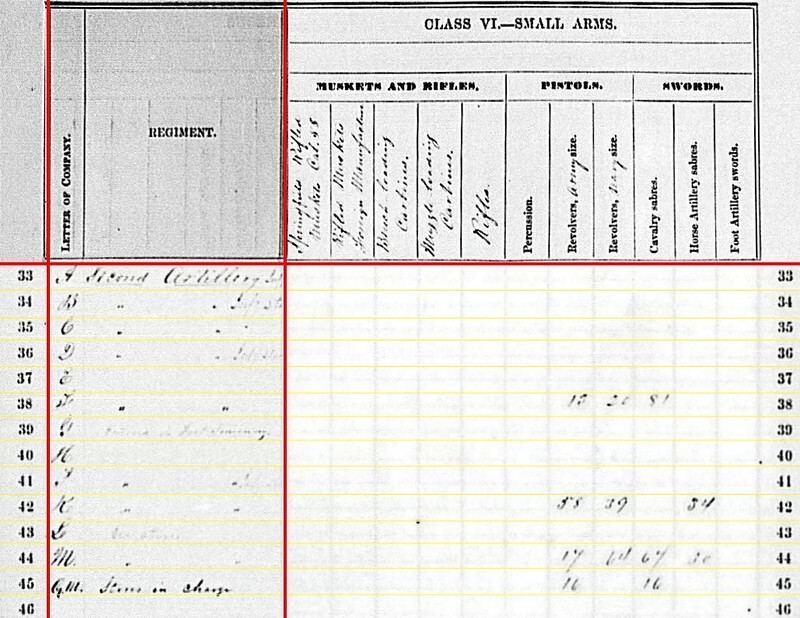 By January 1862, most of the regiment’s batteries were considered organized and were actually drawing in more recruits (all new three-year enlistments). The Second Missouri Artillery was first enrolled as Home Guards, but with their own consent they were afterwards regularly mustered in as three-year volunteers… and the matter was fully explained in German and English. The Second Missouri Artillery was reorganized and became volunteers soon after Major-General Halleck assumed command of the department. Therefore it is not to be considered as belonging to the Reserve Corps. But even were this not the case, that regiment would be retained in service, since their services are needed in the position for which they were originally enlisted, and there are no other troops which can be used to replace them. Therefore the Second Missouri Artillery will not be mustered out of service. A detachment of this regiment at Pilot Knob serving with a battery is in mutiny. 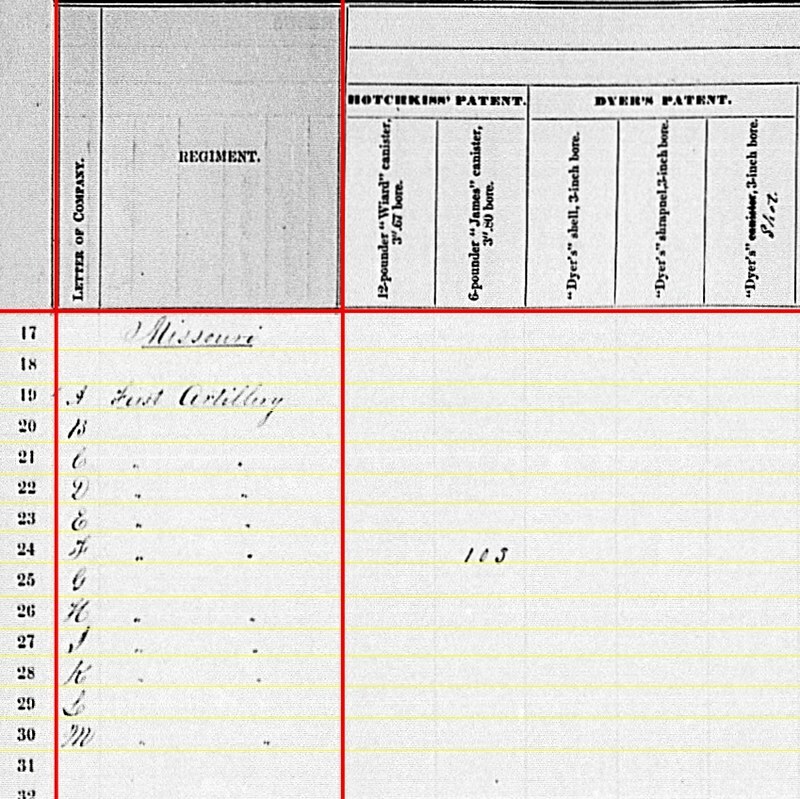 Another serving with a battery at Benton Barracks was recently in mutiny. Another serving as heavy artillery at Cape Girardeau was recently in mutiny. 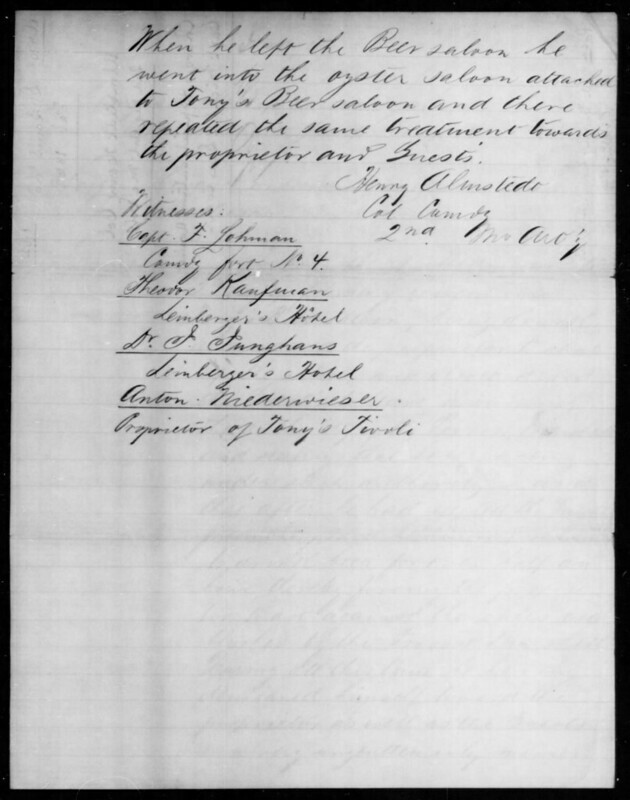 A detachment serving with the Twenty-second Iowa Volunteers by department orders left that regiment and is, I am informed, in this city, thus deserting their station. This calls for a decision upon the difference between the officers and men as to what the regiment is, whether as volunteers or Reserve Corps. In reaction to the mutinies and other troubles, Curtis convened a board of inquiry in April. That board concluded the regiment’s original muster, in the summer of 1861, had been illegal. Furthermore, the change of status to three-year enlistments was invalid. The board recommended that the regiment be reorganized, should the command deem it necessary to retain the 2nd Missouri in service. And Curtis agreed with that suggestion. Those men who were unfit for service should have been discharged and the regiment filled up or its organization reduced. The men had no claim whatever for a discharge on the ground of improper enlistment. And now the regiment should be filled up, if possible, and if not, its organization should be reduced. The Second Missouri Artillery Volunteers will be reorganized and recruited to its maximum as rapidly as practicable. For this purpose a military board will be appointed to examine the capacity, qualifications, propriety of conduct, and efficiency of all the commissioned officers of the regiment, and to consolidate the men remaining in the regiment after the muster out hereby ordered into the proper number of full companies. Upon the report of this board the commanding general will order the muster out of such officers as shall not be found fitted for their positions. This order cleared the way to finally, and permanently, resolving the issues caused by Fremont’s hasty organization, Halleck’s blunt approach to reconciliation to regulations, and Curtis’s somewhat tone-def management…. if I may be so bold. In short order, the regiment was reduced to a battalion. Captain Nelson Cole, who was then on staff as the Artillery Chief for the district, transferred out of Battery E, 1st Missouri to accept a Lieutenant-Colonel’s position in the Second Missouri. 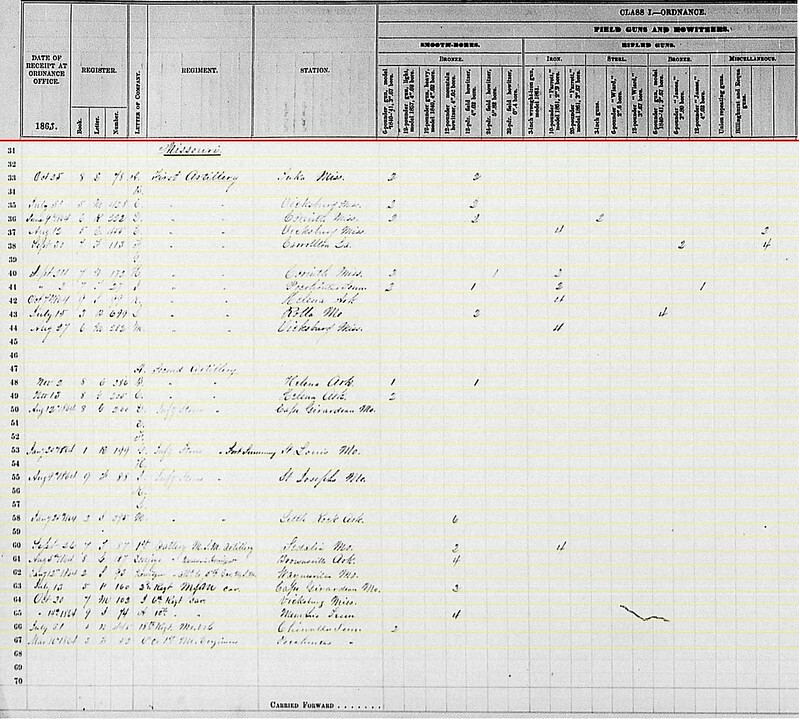 Cole’s date of rank was October 2, 1863. And that date might be considered the start of the reorganization of the regiment. Enough men remained to form five companies of heavy artillery. The First Flying Battery, originally Pfenninghausen’s and later Landgraeber’s Battery, an independent formation, transferred in to become Battery F. The 1st Missouri State Militia Battery (also known as Thurber’s or Waschman’s Battery) became Battery L. And new enlistments began to fill in the rest of the ranks. Not until February was the regiment completely reorganized to full strength. At which time, Cole was promoted to Colonel. From that point forward to the end of the war, the 2nd Missouri Artillery had a less contentious and administratively conventional history. In 1864, most of the heavy artillery companies were reequipped as field artillery. These batteries would see field service in Missouri, Arkansas, Tennessee, and Georgia. One battery served in the Atlanta Campaign. Most of the others saw service repelling Price from Missouri in the fall months of 1864. The field grade officers, including Cole, served in several key staff positions, providing a cadre of artillery chiefs. As many of those three-year enlistments remained at the close of the war, the regiment was only slowly mustered out. Some batteries saw service on the Powder River Expedition of 1865, under a column commanded by Cole. We might say that despite its unconventional origin and mutinous reputation, the 2nd Missouri matured into a very proper organization by the end of the war. Sources: Aside from the Official Records and other common sources, material for this post comes from “Missouri troops in service during the civil war : Letter from the Secretary of war, in response to the Senate resolution passed on June 14, 1902”, Washington, D.C.: Government Printing Office, 1902. Military things being what they were, when an officer is placed under arrest we are conditioned to expect some epic episode worthy of note… documented, of course, with a court marshal or other formal proceeding. While there were all sorts of reasons for arrests, generally these fit into two broad categories – disobedience (not obeying orders) and misconduct. And displays of misconduct more often than not are influenced by consumption of alcoholic beverages. The case of Michael Laux fit into that latter category. 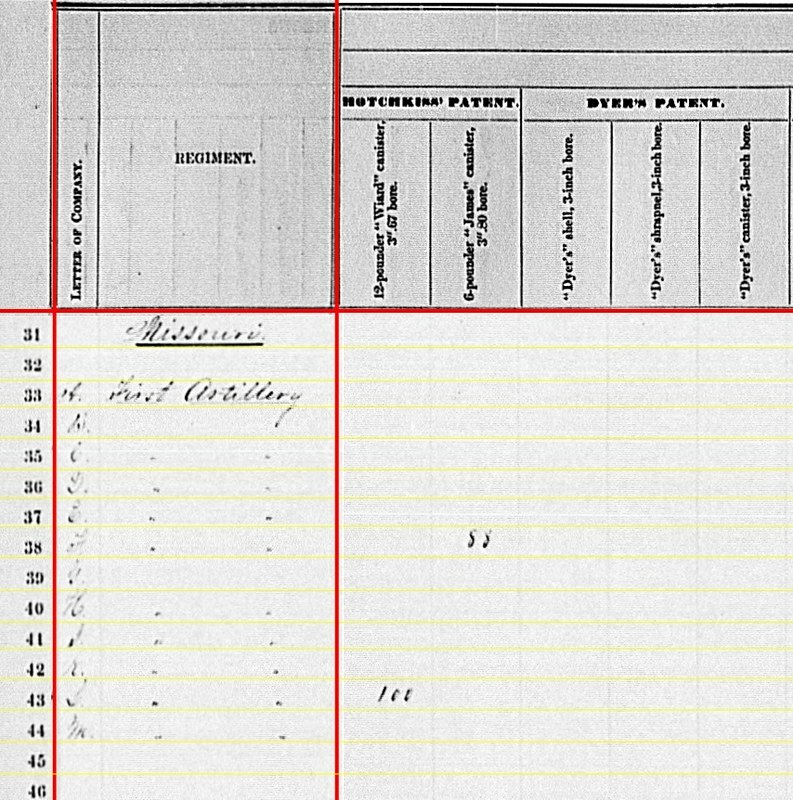 Laux was an immigrant, listed on the 1860 census as a carpenter originally from Bavaria, specifically the Rheinpfalz region. At age 37, he lived in St. Louis with his wife Sibilla, aged 34. They had two daughters, Margaretha and Mary, both born in Missouri and aged eight and six, respectively. According to service records, Laux first joined the 1st US Reserve Infantry, Missouri Troops – a short enlistment early war formation – as a private. He was commissioned a captain in the 2nd Missouri Artillery on September 26, 1861 and assigned to Battery A. The regimental book had Laux at five feet, 10 inches tall, with dark complexion, brown eyes, and dark hair. Charges and specifications against Capt. Michael Laux, Camp A, 2nd Mo. Art’y. Charge. Conduct unbecoming an officer and gentleman. Specification. 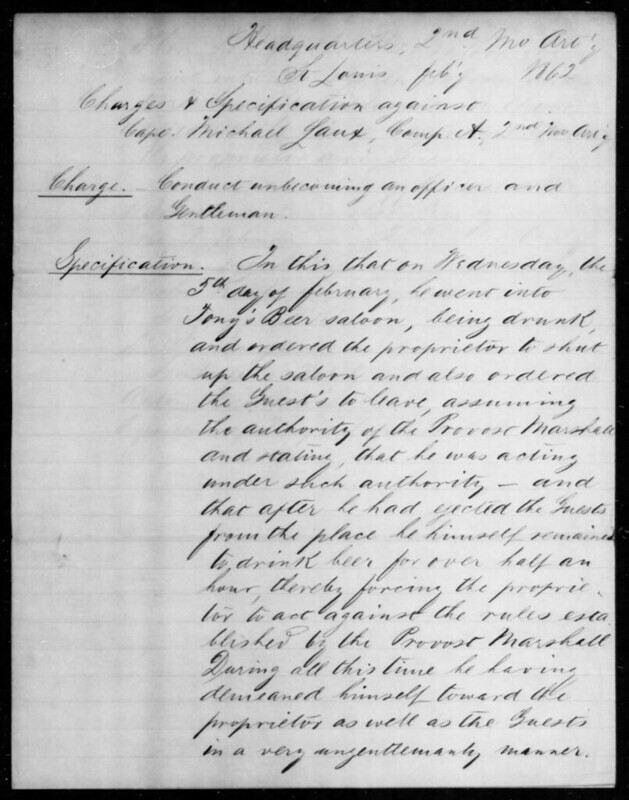 In this that on Wednesday, the 5th day of February, he went into Tony’s Beer saloon, being drunk, and ordered the proprietor to shut up the saloon and also ordered the guests to leave, assuming the authority of the Provost Marshall and saying that he was acting under such authority – and that after he had ejected the guests from the place he himself remained to drink beer for over half an hour, thereby forcing the proprietor to act against the rules established by the Provost Marshall. During all this time he having demeaned himself toward the proprietor as well as the guests in a very ungentlemanly manner. When he left the Beer saloon he went into the oyster saloon attached to Tony’s Beer saloon and there repeated the same treatment towards the proprietor and guests. Col., Commanding, 2nd Mo. Art’y. Captain F. Johnson, Comdg. Fort No. 4. Theodore Kanfuian (? ), Seinberger’s Hotel. Dr. F. Tunghans (? ), Seinberger’s Hotel. Anton Niederwieser, Proprietor of Tony’s Tivoli. Of the witnesses, those from Seinberger’s Hotel appear to be guests at the bar. With the name, Niederwiser, we can trace the location of the incident to Tony Niederwiser’s Beer Garden and Billard Saloon, at 17 South 4th Street, between Market and Walnut Streets (according to the 1863 St. Louis City Directory). No indication from the records what prompted Laux’s behavior. He was taken into custody two days after the incident. He was apparently released back to duty within a couple of weeks. Then in May he was granted a furlough, then returned to duties. Battery A was detached for service at Rolla, Missouri in July 1862, with Laux in command. The battery returned to St. Louis in late January 1863. Then on February 27, Laux was under arrest again. It is not clear if this arrest was due to a new charge or related to the earlier incident. But what is clear, Laux was in jail. This time Laux remained in custody at least through September. In July he was removed from the battery rolls. 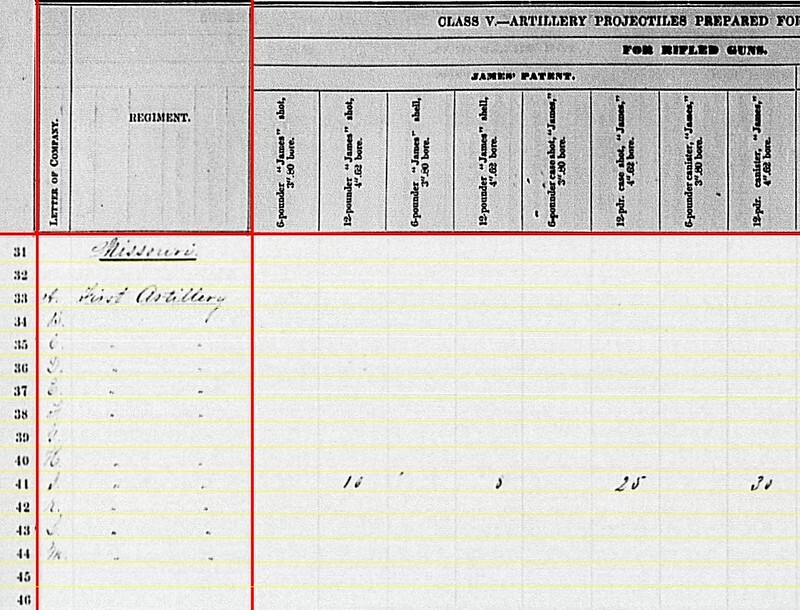 In late September, his enlistment was up and, like others in the 2nd Missouri, was eligible for discharge. In Laux’s case, it appears formal charges were never brought forward. Instead, Laux was released, on September 28, 1863, to a board established to adjudicate those men from the 2nd Missouri then leaving service. But Laux was not discharged, the department indicated there were accounts to settle. This added insult to injury, as Laux was still formally IN the service but not being paid for being in service (since his term had run out). Finally, on December 5, 1863, by orders of Major-General John Schofield, Laux was “honorably mustered out of service” with the proviso that his final pay would be held until all accounts were settled…. you know, the old “we’ll send you a check in the mail” routine. Thus ended Laux’s military service. 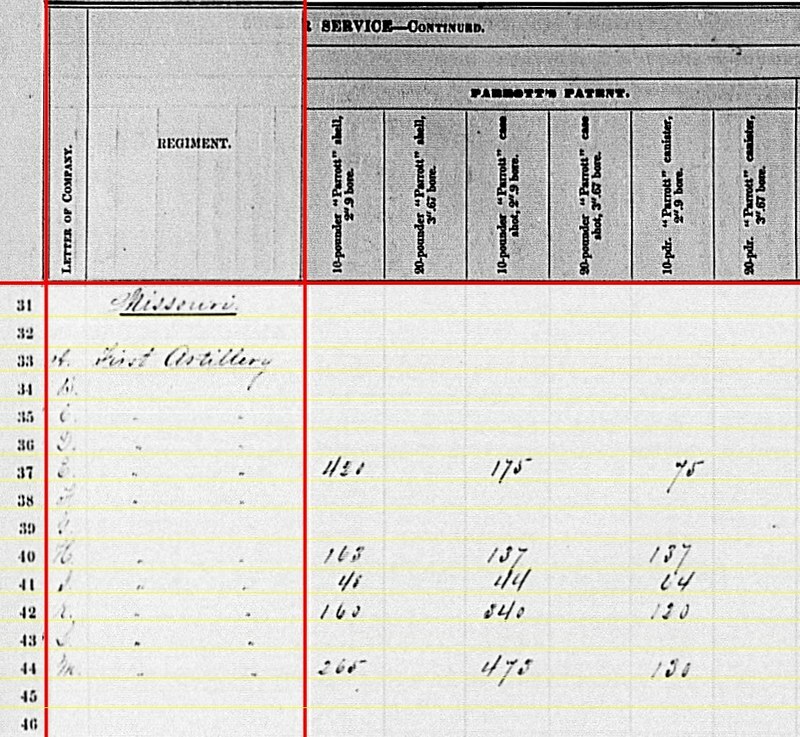 He appears on the draft rolls for 1863, listed as a carpenter living on Carondelet Avenue (matching an 1864 city directory listing). Post-war, Laux moved to 915 Shenandoah Street. 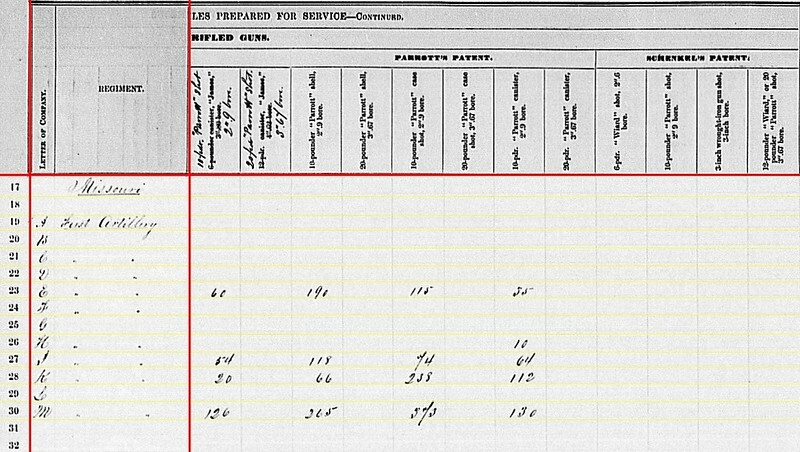 The 1870 census found him with his wife Sevilla, but now with two boys and a young girl – Jacob (9), Henry (6), and Phillipine (4). Clearly Michael and Sevilla maintained a prosperous home. What of Margaretha and Mary? With both of age by 1870 (you know they married young back then), it is no big surprise to see them out of the house. The oldest, Margaretha, died in Nevada in 1927. But Mary is a mystery to me. Laux applied, and received, a pension in 1887. He was still at the Shenandoah Street address when he died of endocarditis on October 29, 1894. Sevilla survived him and worked as a housekeeper until her death in April 1900. Laux may have avoided major battles and thus lacks celebratory events in his service record. There is little evidence for us to evaluate Laux’s ability or qualities. Yet, there was honor attached to his service, even if clouded. The weighty question is, what prompted the incident of February 5, 1863? As a “westerner”… or dare I say “Trans-Mississippian”… from my youngest days, it was impressed upon me, through my own studies and the words of others, that nothing regarding Missouri and the Civil War is straight forward. Such is certainly the case with respect to Missouri’s artillery batteries serving the Federal army during the war. 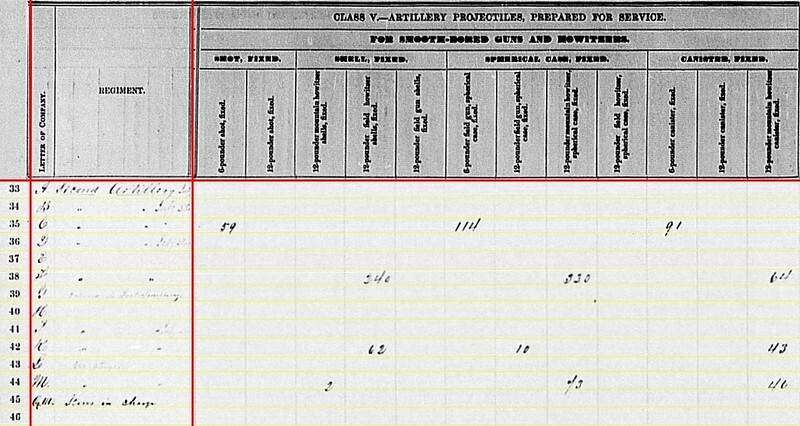 While the state provided two “on paper” organized regiments of light artillery, there were in addition several independent batteries, militia batteries, and other sections and detachments. And within that loose structure, there were oddities and questions in terms of administrative arrangements and issued equipment (which we’ll focus on here). 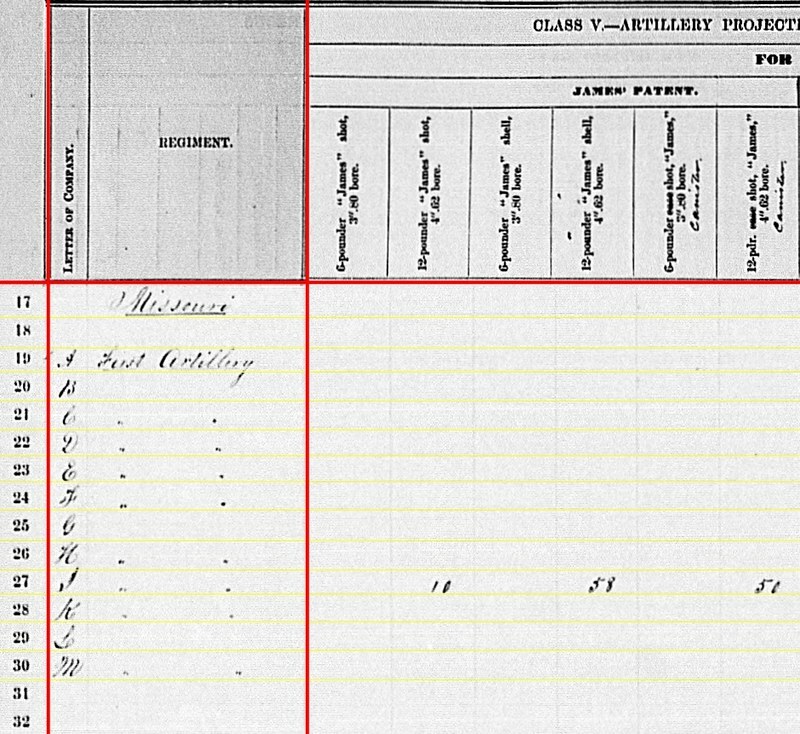 Battery A: Reported at Iuka, Mississippi with two 6-pdr field guns and two 12-pdr field howitzers. Captain George W. Schofield remained in command. And the battery remained with Twelfth Division, Thirteenth Corps. As such, the location given is at odds with the battery service record. In June 1863, the battery was at Vicksburg, part of the besieging force. In October 1864, when the report was received in Washington, the battery was at Carrollton, Louisiana, having transferred to the Department of the Gulf. Iuka does not fit into the time line for this battery. Battery B: No return. At the start of the spring, this battery was assigned to the Second (Brigadier-General Francis J. Herron’s) Division, Department of Missouri during the quarter. Captain Martin Welfley returned, from his staff assignment, in late May. Then in June the battery moved, with it’s parent organization, to Vicksburg and was assigned to the Thirteenth Corps. Arriving at Vicksburg on June 14, the battery fell in on a 32-pdr gun during the siege in addition to their own 12-pdr Napoleons and field howitzers. Battery C: Reporting from Vicksburg, Mississippi with two 6-pdr field guns and two 12-pdr field howitzers. Captain Charles Mann remained in command, with the battery assigned to Sixth Division, Seventeenth Corps. Battery D: At Corinth, Mississippi, with two 6-pdr field guns (a reduction from four the previous quarter), two 12-pdr field howitzers, and two 3-inch rifles. The battery, under Captain Henry Richardson was assigned to Corinth, part of the Sixteenth Corps. Battery E: At Vicksburg, Mississippi with four 10-pdr Parrotts and two “Fawcett Rifled Iron Gun, Cal. 3.5.” Note the designation change from a generic “English Guns” the previous quarter. In late May, Captain Nelson Cole’s battery moved to St. Louis, and with their parent division (Herron’s) then moved to Vicksburg. Battery F: Carrollton, Louisiana with two 3.80-inch James Rifles and four 3.5-inch Fawcett Guns. The location reflects a reporting date of September 1863. Battery F, like Batteries B and E, was part of Herron’s Division sent to Vicksburg in June 1863. Captain Joseph Foust remained in command. Battery G: No return. Captain Henry Hescock’s battery was assigned to the Third Division, Twentieth Corps. Hescock was also listed as commander of the artillery brigade supporting the division. As of the reporting date, they were on the Tullahoma Campaign. Battery H: At Corinth, Mississippi with two 6-pdr field guns, one 24-pdr field howitzer, and two 10-pdr Parrotts. Captain Frederick Welker’s battery was part of the garrison at Corinth, under the Sixteenth Corps. Battery I: Reporting at Pocahontas, Tennessee (a railroad stop northwest of Corinth), with two 6-pdr field guns, one 12-pdr field howitzers (down by one from the previous quarter), two 10-pdr Parrotts, and one 4.62-inch rifle (cited as a 12-pdr James, see mention below). Captain Benjamin Tannrath commanded the battery, assigned to the Sixteenth Corps, under the Corinth Garrison. Battery K: At Helena, Arkansas with four 10-pdr Parrotts. Captain Stillman O. Fish was in command. The battery was part of the District of Eastern Arkansas. Battery L: At Rolla, Missouri with two 12-pdr field howitzers and four 3.67-inch rifles. Captain Frank Backof’s Battery, remaining with the Department of the Frontier, was with a portion of Herron’s Division not forwarded to Vicksburg. Battery M: At Vicksburg, Mississippi with four 10-pdr Parrotts. Captain Junius W. MacMurray’s battery remained assigned to Seventh Division, Seventeenth Corps. So of the twelve batteries of this regiment, half at Vicksburg. Four other batteries were indirectly supporting that campaign. Battery G was on the Tullahoma Campaign. Leaving only Backof’s Battery in their home state. The variety of armament should excite readers. Naturally the mention of Fawcett guns is noteworthy. But we’ve seen those reported from previous quarters. It’s the 12-pdr James rifle, with Battery I, which stands out for this summary. The column header (part of the form) clearly calls this out as a bronze weapon. And specifically 4.62-inch caliber. We can’t dismiss this simply as transcription error because, as we will see below, the battery also reported ammunition in that caliber. So either a lot of transcription errors…. or a bronze 12-pdr rifle was with the battery. Certainly not the rifled 12-pdr Napoleons that are seen at Gettysburg. Those were only used for tests. Rather, the leading candidate is a 12-pdr field gun, heavy, that had been rifled to the James system. Several of those survive today. And with Battery I posted to guarding a railroad, form seems to follow function. Until I find more information, I’d still rate that tentative. Battery C: 65 shot for 6-pdr field guns; 124 shell, 96 case, and 64 canister for 12-pdr field howitzers. Battery D: 182 shot, 50 case, and 87 canister for 6-pdr field guns; 119 shell and 38 canister for 12-pdr field howitzers; and 162 case for 12-pdr Napoleons (which may be a transcription error). Battery H: 130 case and 28 canister for 6-pdr field guns; 69 shell, 53 case, and 60 canister for 24-pdr field howitzers. Battery I: 15 shot, 195 case, and 109 canister for 6-pdr field guns; 49 shell, 36 case, and 71 canister for 12-pdr field howitzers. Battery L: 184 case and 80 canister for 12-pdr field howitzers. The limited number of rounds for Battery A stand out in particular. Just canister… for the siege of Vicksburg. Go figure. Battery D: 40 canister, 98 percussion shell, 152 fuse shell, and 270 bullet shell for 3-inch rifles. Battery F: 12 shot and 86 percussion shells for 3.80-inch rifles. Battery L: 280 shot and 270 percussion shell for 3.67-inch rifles. Once again we see those in the field, and those in Washington, make distinction between the 3.80-inch “James” and the 3.67-inch “Wiard” calibers. We should not read into the latter identification, as that was simply tied to a caliber of gun, though not specifically the inventor’s gun. In this case, Backof’s battery had rifled 6-pdrs. Battery F: 88 canister for 3.80-inch rifles. Battery L: 100 canister for 3.67-inch rifles. Battery I: 10 shot, 8 shell, 25 case, and 30 canister for 4.62-inch rifles. Battery E: 420 shell, 175 case, and 75 canister for 10-pdr Parrotts. Battery H: 163 shell, 137 case, and 137 canister for 10-pdr Parrotts. Battery I: 48 shell, 44 case, and 64 canister for 10-pdr Parrotts. Battery K: 160 shell, 340 case, and 120 canister for 10-pdr Parrotts. Battery M: 265 shell, 473 case, and 130 canister for 10-pdr Parrotts. Battery E: 130 shot for 10-pdr Parrott. Battery I: 54 shot for 10-pdr Parrott. Battery K: 92 shot for 10-pdr Parrott. Battery M: 126 shot for 10-pdr Parrott. Battery A: Fourteen percussion pistols, twenty Navy revolvers, and ninety-three cavalry sabers. Battery C: Three (?) Army revolvers and four cavalry sabers. Battery E: Seventy-seven Army revolvers and forty-four cavalry sabers. Battery F: Ten Army revolvers and eighteen cavalry sabers. Battery H: Eight Army revolvers and forty-eight (?) cavalry sabers. Battery K: Three Navy revolvers and twenty-five cavalry sabers. Battery L: Eleven Navy revolvers and thirty-nine cavalry sabers. Other than the percussion pistols, no oddities among the small arms. There are a lot of reenactor impressions “taking a hit” right now. We will pick up with the 2nd Missouri Artillery next. Earlier in January, I offered a brief, general service history of the batteries of the 1st Missouri Light Artillery in the preface to the fourth quarter, 1862 summary. As noted at that time, there is much to “untangle” when matching the Missouri batteries to alternate names and designations that appear in the records. Keep that in mind as we review the Missouri entries over the next couple of posts in this set. Battery A: No return. Captain George W. Schofield’s battery began the quarter as part of the District of Eastern Arkansas. Their formation bore the very unlucky designation of the Thirteenth Division, Thirteenth Corps. As the corps organized for the Vicksburg Campaign, the battery shifted to the Twelfth Division of that corps. The battery accompanied it’s parent formation during the Yazoo Pass operations that winter. They returned to Milliken’s Bend in April. Battery B: No return. The battery was assigned to the Second Division, Department of Missouri during the quarter. Captain Martin Welfley remained in command. However, Welfley also served as artillery chief for the department, starting in mid-March. It is unclear if a subordinate held battery command at that time. Battery C: Reporting from Lake Providence, Louisiana with two 6-pdr field guns and two 12-pdr field howitzers. Formerly known as Mann’s Independent Battery, the battery was under Lieutenant Edward Brotzmann at the start of the year and assigned to Sixth Division, Sixteenth Corps. Captain Charles Mann returned to command the battery during the winter. When Sixth Division transferred to Seventeenth Corps, Mann’s battery went along. Battery D: At Corinth, Mississippi, with four 6-pdr field guns, two 12-pdr field howitzers, and two 3-inch rifles. The battery, under Captain Henry Richardson, was part of a battalion of Missouri artillery serving at Corinth under Major George H. Stone, in Sixteenth Corps. Of note, the battery’s reported armament differed greatly from that indicated the previous quarter (five 20-pdr Parrotts). Battery E: Indicated at St. Louis with four 10-pdr Parrotts and three “English Guns, Cal. 3.5.” The latter were products of Fawcett & Preston in Liverpool. During the winter, Captain Nelson Cole resumed command of this battery assigned to the Department of the Frontier. The battery moved to Springfield, Missouri in mid-February. Later moved to Rolla. Not until later in the spring did the battery reach St. Louis, as part of the reinforcements sent to Vicksburg. A reorganization to be discussed in the next quarter. Battery F: At Rolla, Missouri with two 3.80-inch James Rifles and four 3.5-inch English Guns. Battery F’s story is paired with Battery E’s for the most part. During the winter, Captain Joseph Foust (from Battery E) assumed command. And like Battery E, Foust’s remained with the Department of the Frontier through the winter, to be pulled into the Vicksburg Campaign later in the spring. Battery G: No return. Captain Henry Hescock’s battery wintered at Murfreesboro, being placed in the Third Division, Twentieth Corps. Battery H: Also at Corinth in Stone’s Battalion and reporting two 6-pdr field guns, one 24-pdr field howitzer, and two 10-pdr Parrotts. Captain Frederick Welker remained in command. Battery I: Also part of Stone’s Battalion at Corinth, with two 6-pdr field guns, two 12-pdr field howitzers, and two 10-pdr Parrotts. By the end of the spring, Captain Benjamin Tannrath commanded the battery. Battery K: At Germantown, Tennessee with four 10-pdr Parrotts. Transferring out of Stone’s Battalion, Captain Stillman O. Fish’s battery was placed in the District of Jackson. Later in the spring, the battery began movement to Helena, Arkansas. Battery L: No report. Captain Frank Backof’s Battery was part of the Department of the Frontier and station at Springfield. Battery M: On July 10, 1863, this battery could proudly claim to be at Vicksburg, Mississippi. But at the end of March of that year, they’d only begun the journey to that place. Captain Junius W. MacMurray’s battery was around Lake Providence at the close of the quarter, assigned to Seventh Division, Seventeenth Corps. The battery reported four 10-pdr Parrotts. Battery C: 160 shot, 160 case, and 80 canister for 6-pdr field guns; 108 shells, 108 case, and 64 canister for 12-pdr field howitzers. Battery D: 280 shot, 204 case, and 145 canister for 6-pdr field guns; 120 shell, 337 case, and 38 canister for 12-pdr field howitzers. Battery H: 109 shell, 62 case, and 66 canister for their 24-pdr field howitzer. Battery L: 15 shot, 260 case, and 155 canister for 6-pdr field guns; 120 shell, 109 case, and 145 canister for 12-pdr field howitzers. Battery K: 90 case and 28 canister for 6-pdr field guns. Battery D: 42 canister, 46 percussion shell, 80 fuse shell, and 240 bullet shell for 3-inch rifles. I break out Battery F in detail as the battery reported rifles in two distinct calibers. 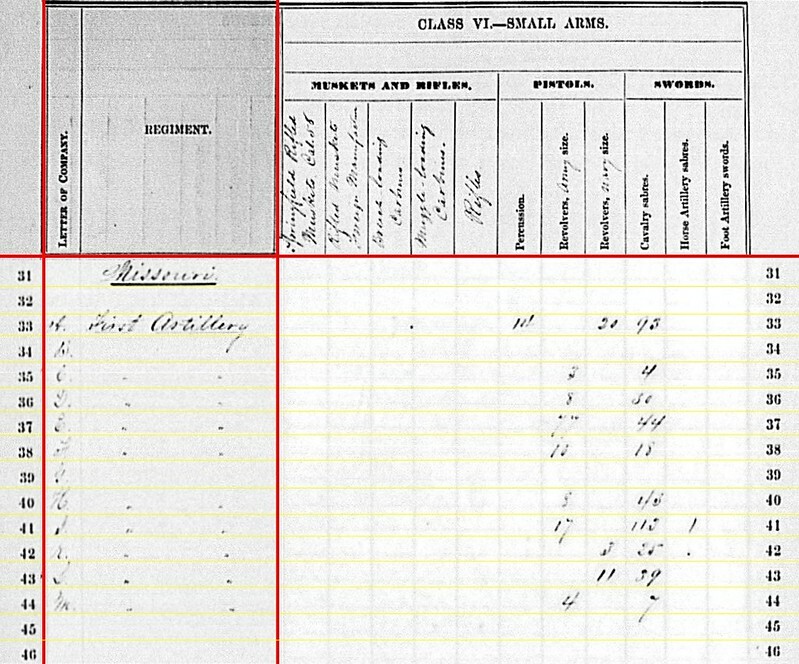 We have to question here if they were using 3.67-inch projectiles in their James Rifles, or if some quantities might reflect the clerk’s attempt to reconcile 3.5-inch ammunition quantities in the form. Battery K: 172 shot and 12 shell in 3.80-inch. Battery E: 630 shell and 131 canister for 10-pdr Parrott. Battery H: 13 shell, 60 case, and 117 canister for 10-pdr Parrott. Battery I: 44 shell, 74 case, and 46 canister for 10-pdr Parrott. Battery K: 160 shell, 340 case, and 120 canister for 10-pdr Parrott. Battery M: 152 shell, 240 case, and 152 canister for 10-pdr Parrott. Battery E: 89 shot for 10-pdr Parrott. Battery I: 79 shot for 10-pdr Parrott. Battery K: 90 shot for 10-pdr Parrott. Battery M: 80 shot for 10-pdr Parrott. Battery K: 200 cansiter for 3.67-inch and 100 canister for 3.80-inch. And again, we must wonder if some of these were 3.5-inch caliber, but lacking a column were simply “dropped” into the form by the clerks. Battery C: Three Army revolvers and thirty cavalry sabers. Battery D: Thirty cavalry sabers. Battery E: Eighty-one Army revolvers and fourty-seven cavalry sabers. Battery F: Six Army revolvers, six Navy revolvers, and fifteen cavalry sabers. Battery H: Six Army revolvers and forty-three horse artillery sabers. Battery I: Fourteen Army revolvers, 136 cavalry sabers, and one horse artillery saber. Battery M: Seven Army revolvers and seven cavalry sabers. 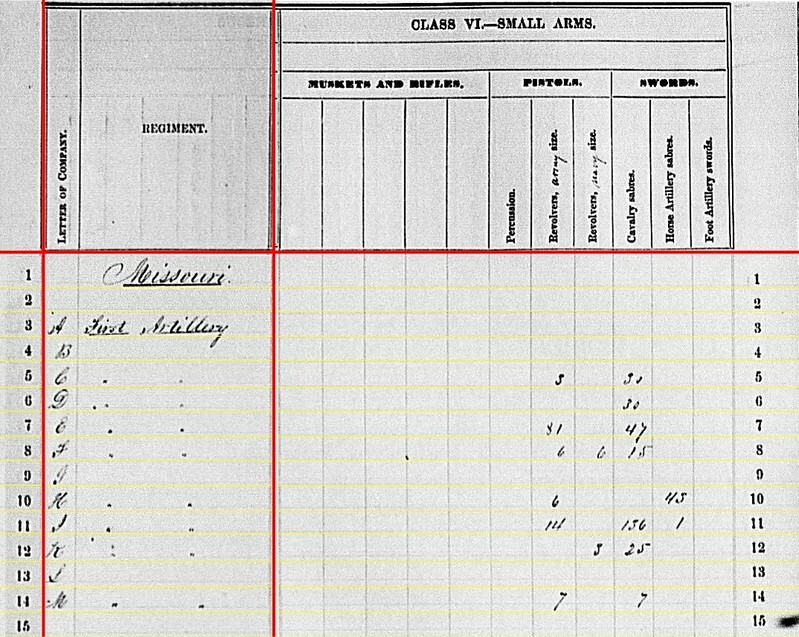 The small arms reports are always interesting to me, as I look for correlations between quantities and the assignments. In this case, maybe Backof’s Battery needed a lot of edged weapons given their duty in southeast Missouri. We’ll look at Missouri’s Second Light Artillery Regiment in the next installment.